Here we are in the second week of the regular season for most clubs (Men’s club D1 starts next week) are playing matches, yet should you be naughty and scroll down directly to the match reports you would only see 12 items. I find it a little hard to believe that there were only 12 matches played (and that includes B sides) so referees, please put your narrative in when reporting scores in our new system, whostheref. As a rule of thumb it is best to have your entries in by noon on Wednesday as that is when I usually start downloading. Of course, there are other reasons for the paucity of meandering musings. The assignment system is new and perhaps people haven’t bothered to learn how to use it or are put off its idiosyncrasies. If that is the case I highly recommend sending an email to R Scott Wood demanding instructions on how to use the system and fill in your scores and narrative. While CMS may be the official system of record, whostheref can work as a remote backup in case of disaster (every system needs a good disaster recovery plan). Plus, players, coaches and fans like to read this stuff. We get around 10,000 hits a month and it isn’t just the witty banter at the top. Probably in spite of it. Another reason may be that the API used to extract the reports is a bit of a black box. I do not know the parameters that are set up for the extract so I may be missing reports because they just don’t get to me. I am working on getting more information on what exactly is being extracted. Of course there is another reason for fewer reports this year than in the past. Much like a strong man in cold water, the NCRFU has recently undergone a little shrinkage. Just this past year South Valley, Sacramento Lions, Napa Wine Thieves and Colusa Women have all folded. Many of these free agents will play with other clubs – technically South Valley merged with the San Jose Seahawks, Lions players have the choice of Capitols or Blackhawks and Napa probably sent players to Santa Rosa – but not all. Where will the women of Colusa go? Do you really want to play for your cross town rival? In spite of assurances to the contrary, we are losing clubs and that means losing players. Yes, the youth game is growing but the club game is not and that is a concern. As it is rugby needlessly loses far too many athletes once they matriculate and not having a solid club to land in is one of the many factors in that statistic. Clubs have folded before and the game still lived on, so what is the big deal? Won’t other, new clubs just form to take their place? The reason this is a big deal was touched on in the previous paragraph: youth. We are in the middle of a youth explosion when it comes to rugby participation and as a sport we do not want to lose all of these kids when they leave school. It is imperative that there is a place for them to go when they do so. Some clubs may just form senior sides when enough players move on – see Silicon Valley – but that is a rare thing and takes a few very strong willed individuals to drive the creation of a club. Perhaps I am tilting at windmills here, but I see this as a pivotal moment in our sport and in Northern California. Very soon we may have more U19 and Youth players than senior players and if our game is to grow we need to accept the challenge of retaining these players. You will never get 100%, but we should at least strive for a majority. How is this done? I don’t have all the answers but I have some suggestions. 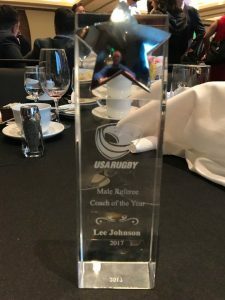 USA Rugby and the NCRFU have already taken strides in implementing the tighter field regulations already in place at the youth level, such as team technical zones and that is a start, but the overall product needs to improve. I am not talking about the product on the field, but the field itself. The clubs themselves. Look professional, like you know what you are doing. Little details matter. Impressions matter. As referees we need to do our part as well. When you are at a match you are often the lone representative of the entire society and what each of us does reflects on all of us. Be professional. Be prompt. Be friendly. Be whatever you need to be to help a great rugby event occur. It is the least we can do. If not, we will have to deal with some embarrassing shrinkage for quite a while. The biggest rugby tournament in North America is looking for YOU! The Las Vegas Invitational needs you on March 1st, 2nd, and 3rd to help volunteer and officiate 7’s (and a select few 15’s) matches across youth, collegiate, and adult divisions in Sin City. As our tournament continues to grow, so does the number of referees needs to keep this event rolling! Come ref by day, and enjoy the most exciting city on earth by night! Northern California brought a great number of refs last year, and we can’t do it again without you! Westgate Hotel link: https://aws.passkey.com/go/SLVI8R – again, with waiving resort fees, you get the cheapest rates and get to stay at an incredible resort and the hub of the LVI. It was a beautiful day on the island for some midday footy, with lots of sunshine and little to no wind. The SFGG women came out fierce, playing the first quarter with a lot of intent, especially getting physical around the breakdowns. Keeping the game plan fairly simple, they were able to get some good individual runs to tally up some tries early. A young All Blues side took a little bit to get going, but once they did the momentum started to turn over ever so slowly into the second quarter. The All Blues defense was getting a bit pinched in and were just unable to really string together a fast enough attack around the outside. The hard working forwards were able to capitalize on some errors by SFGG, punching a try in on forward picks. It was a great day for handling as well, we didn’t have our first scrum until the 24th minute! The second half was a great contest between the two sides, as they were playing much more evenly at this point. This was most definitely a forwards heavy game, with lots of action for both packs. The All Blues with some quick thinking and good ball movement, were able to get 2 more tries in on SFGG. However, the hard second push came a little too late, as they ran out of time to try and catch up. The Gate women dotted one more try down to seal the deal. Congratulations to Gate on the solid win, and well played by Berkeley! Both teams wanted to play enterprising rugby and started off well. Colusa worked a score after about 10 minutes before losing a player the sin bin at 12 minutes. After the return of the player, Colusa started to increase the pressure with hard running lines at good angles. The half finished at 26 – 7 with Colusa having 4 tries to Berkeley’s single, well worked score. In the second half, the effort of defending Colusa’s hard lines wore down the visitors who gave up five more tries while running in two of their own. Great day for rugby–sunny, mid to upper 50s, plenty of spectators (est. 5,200). Chico State retained possession for a majority of the match. Knock-ons and tackle infringements were frequent. First half ended with Chico State leading 19-0. It was a crisp clear day in our state capital as the home standing Amazons hosted the visiting side from Santa Rosa. Sacramento dominated the first half, using coordinated back line play and bruising runs from their forwards to set the tone. The visitors played with discipline, but the mix of rookies and vets couldn’t hold the line against the more experienced Sacramento side. The Amazons put up 53 points in the first half, with Santa Rosa answering with just 5. The Sacramento #11 showed off a nifty bit of athleticism, attempting conversions with both her right and left foot depending on the angle. The second half was closer, as Santa Rosa showed no inclination to pack it in early. Though both sides brought made substitutions the second half, the level of play didn’t change. Santa Rosa’s inside center ripped off a series of dazzling runs to help the final score look less lopsided. The Amazons’ most noticeable sub was like a secret weapon from a sports movie. The reserve forward, wearing #17, came in and took the opening kick off of the second half through several would-be tacklers. That would prove to be her stock in trade as she continued to run over, defenders time and again, the perfect type of player to bring in against a tired defense. The indelible play of the game came when one of Santa Rosa’s subs, easily the smallest player on the field, found herself one-on-one against the Amazon’s #17. It looked like a potential disaster, before the visiting player executed a perfect form tackle, right at the knees for an improbable and temporary victory. It was one of those moments within the game that remind us why we play, ref, or watch. That moment that shows that no matter the score, or the size difference, sports are about challenging yourself in those moments to see what you can be. It was a play that exemplified and encapsulated the match. One team facing long odds against stronger opponent, but never backing down. Well played by all. Old Gaels and Silicon Valley played a hard clean game on a great field at Cal Maritime. The field, while astro-turf, is well marked and full sized with a nice stadium feel. It was a glorious day and the rains from the day before had abated and conditions were dry, cool and sunny. Perfect conditions for two teams hungry for competition points. Old Gaels opened with two tries in the first ten minutes by moving the ball to the outside backs, who had good hands and fast line speed. Silicon Valley came roaring back but couldn’t breach the line, initially, having to settle for a penalty goal. 12-3. It was clear, especially in the first half, that the Old Gaels outside backs had the edge. While it was a little tighter in the forwards, Old Gaels began to appear slightly dominant especially at the scrum. Every time they ran the ball into the Silicon Valley forwards, they made only small inroads. However whenever they worked the ball wide, their faster backs scored. At halftime it was 31-3. The second half started with a couple of tries to Old Gaels and a try to Silicon Valley: 48-8. At about 20 minutes into the second half, Silicon Valley began running the ball in tight, from the post off the ruck, to great success scoring three tries in about 15 minutes: 48-22. The Old Gales were tiring and Silicon Valley could sense it. The leaders on Old Gales, including their skillful scrum half and captain settled the team, as a try to each team finished out the game. No incidents of foul play, just good clean rugby. My first league game of 2018 took me to Santa Clara University where the woman’s team hosted UC Santa Cruz. Both teams were warming up when I arrived around 10 for a 11:00 kick off. Fields and technical zone all good. Santa Cruz won the toss and elected to kick. The first half was very balanced with both teams scoring three tries apiece. Half time score Santa Clara 19 Santa Cruz 21. Santa Cruz captain Loren #10 scored two tries in the second half, both 50 plus meter runs breaking numerous tackles. The first was scored with Santa Cruz a player down due to repeat penalties. Both teams had new players who came into the ruck from the side and played the ball on ground at breakdowns. This led to more whistles than I like. But both teams show allot of potential. Santa Clara scored one try in the second half to Santa Cruz’s 4 tries. A beautiful winter’s day in California featured a break in the rain from the last few days for perfect conditions in San Jose: low 60s, sunny and very little wind. As I arrived at the (perfectly set up) pitch there already was a youth match between Silicon Valley and EPA Razorhawks in progress – a sight that never gets old. Youth rugby! It’s great to see. I spent a few minutes chatting with old friends either coaching their kids or watching their kids become the next generation of rugby stars (and getting assurances that they would be done by 1:00) before moving on to the teams. Both sides were warming up as I approached but the home side looked to have significantly more participants, an observation that was confirmed when the Vacaville team sheet showed only 2 subs. Early season injuries and squad depth may be an issue going forward with what is otherwise a talented and well coached team. The match started with both sides aggressively running at each other as adrenalin pushed the initial bursts past the point of control and a couple of early knock-ons resulted in scrums. The match then settled into each team executing their pattern and probing the defense with limited success until about 15 minutes in when San Jose stole an overthrown lineout and broke for the line. Good scramble defense kept the home side at bay for a few phases until Vacaville was penalized for not rolling away at a tackle only scant meters from the line. A quick tap and hands to the right saw the impressive #13 Richard Weber for San Jose go over for his first of three tries on the day. A missed conversion put the score at 5-0. At this point the Seahawks started putting Vacaville under more and more pressure as they exerted dominance in all phases. Whether kicking for territory or running good, hard lines at the defense they kept the visitors pinned in their own end for much of the remainder of the half. The few Vacaville forays into Seahawk territory were quickly rebuffed and the pressure was reapplied. Another try (converted) moved the score to 12-0 and at the 30 minute mark San Jose was again hammering away 2 meters from the line when another desperate Vacaville defender was off side and held up San Jose captain Alex Pedjase long enough for teammates to arrive and prevent a grounding. Had the ball been grounded then it was a try but as it wasn’t we now had a penalty try. The combination of multiple infractions within 5 meters and the penalty preventing a try led to a yellow card for the Vacaville #13, who was admittedly unlucky because it was the first penalty he had committed all day. With their man advantage San Joes was able to dot down once more in the half before Vacaville stirred back to life. The last 5 minutes of the period saw the tables turned and Vacaville on the front foot with clever kicking and committed runners breaking tackles. They received their just reward as time expired with a try of their own, duly converted, to go into the break down 24-7, but with momentum and hope and all 15 players to start the second half. Vacaville took their momentum from the end of the first half and rolled straight into the second half, scoring first. Their converted try put the match at 24-14 and the game was still in doubt but that was the last time Vacaville would cross the line. San Jose regrouped and started reapplying pressure, especially at scrum time where they were pushing the visitors around and off the ball for a couple of tightheads. Excellent vision produced accurate tactical kicks that put the visitor’s back three under pressure and the relieving kicks that resulted were mostly aimless punts down the middle of the field for a perfect counterattacking platform. With ball in hand the Seahawks runners were breaking more and more tackles and gaining territory in great chunks. As the home side put more tries on the board the visitor’s lack of depth showed. Having committed both of their replacements there was no help for Vacaville’s tiring legs while San Jose reloaded with fresh bodies and kept turning the screws. All in all, they produced 5 unanswered tries (4 converted) and won comfortably going away. The league should take note: this is not the 1 win team from last year. My thanks to both captains who worked with me to keep the game moving and to John Pohlman who showed up and took an AR’s flag for me. Heavily one-sided match. The Seahawks were coming off a previous A-level match, a little tired. Match settled into place after fifteen minutes following a flurry of tries from Jesters. Two yellow cards by Jesters in the second half: dangerous tackle (9.13), and professional foul hands in the ruck (15.11). Apart from the yellows, discipline good, both sides cooperative and competing vigorously. Thank you to James Hinkin for his referee coaching, two take-ways: think ‘anticipate’, think ‘position’. Looking forward to watching the video, and the next match. Referee coaching has been a point of emphasis in recent years and nowhere more so than in here in the Land of the Pelican. The numerous referee coaches in the society are greatly responsible for the high quality and steady improvement of referees that our society regularly produces. 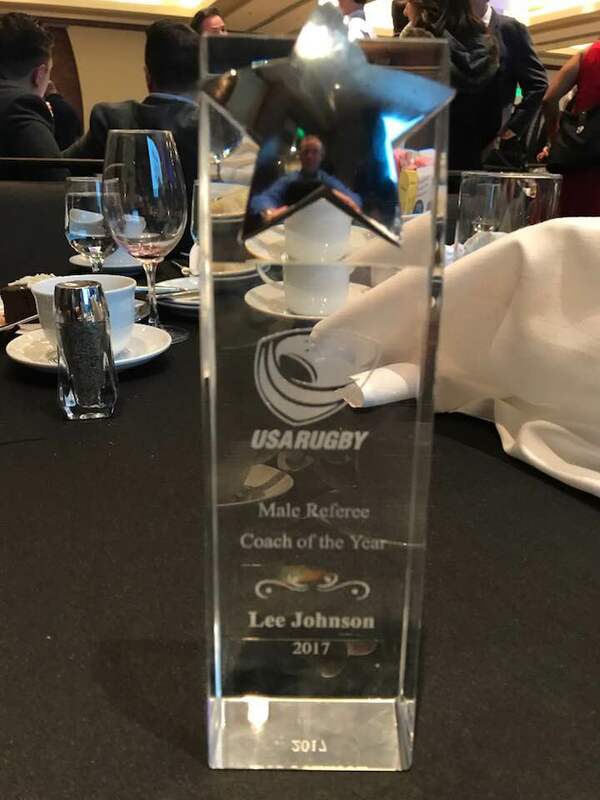 Last week at the USA Rugby National Development Summit our very own Lee Johnson was recognized as the USA Rugby Referee Coach of the Year. Congratulations on an honor well deserved. This entry was posted in News on January 24, 2018 by James Hinkin.